I am also posting my solution. Please save your time and energy on this Question! I have experienced a strange behavior after upgrading TikZ 2 to TikZ 3 when loading and using the TikZ and PSTricks packages (via auto-pst-pdf) at the same time. Please consider this situation of generating barcodes. I had no problem when using TikZ 2, but I got this error message with TikZ 3. ==> 2 pages written on `bug0001-problem-pics.pdf'. I am still tracking down the problem I experienced in a real project: I haven't got the barcodes at all. The realproject.pdf file was empty and therefore pdfcrop generated an error and there was no cropped version of the PDF file. My project is huge, so I wasn't able to emulate my real situation on a small scale yet. If I do, I'll extend this Question. Still, I couldn't hand over the TeX code generating this sort of error to a TeXist/publisher, because I wasn't able to hide it by \batchmode or \nonstopmode. My question is: How to fix it when TikZ 3 is loaded to get no error message of this kind as in TikZ 2? It is better not to know how much time I spent on this one in a real project with deadline as I was getting no barcodes after upgrading the TeX Live distribution/TikZ. 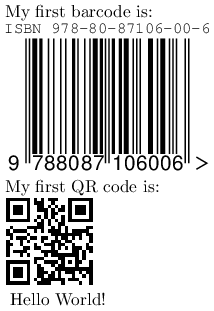 Of course, I could use a separate TeX file just for the barcodes, well, I wanted to solve it. ==> 2 pages written on `bug0001-solution-pics.pdf'. I enclose my solution and a page preview. Not the answer you're looking for? Browse other questions tagged tikz-pgf pstricks barcodes pst-barcode or ask your own question. Does TikZ use the same internal mechanism as PSTricks to produce vector based pdf outputs? how to get PSTricks QR codes to handle tildes properly? How can I get pstricks and tikz to work in the same document?